First Time Cruisers' Tips - Just Cruises, Inc. Call or email Just Cruises, Inc. We'll help you pick the cruise that fits your vacation schedule, budget and personal taste. No! Cruising is one of the best values in travel. Your price includes all your meals, your stateroom, on board activities, plus transportation to some of the most popular ports in the world. Your price can even include round-trip airfare and transfers to and from the ship. For once, you'll know what your vacation will end up costing before you leave. Your vacation can be as short or as long as you want. Just Cruises, Inc. offers itineraries from three days to 100 days. Many times your cruise can be combined with a hotel package before or after your cruise to extend your trip. Groups of U.S. citizen children ages 16 through 18, when traveling with a school or religious group, social organization, or sports team, will be able to enter under adult supervision with originals or copies of their birth certificates or other proof of citizenship. See the Department of Homeland Security's https://www.dhs.gov/how-do-i/for-travelers for more information on the changing travel requirements. For information on how to obtain a passport in Monroe County, NY Click Here. Will I get bored? Feel claustrophobic? Not likely! Few places can offer the freedom you feel at sea. There's plenty of room and plenty to do. You can join in exercise classes, dance classes, sports trivia, bingo, backgammon and swimming. Many ships also offer basketball, volleyball, the use of saunas, Jacuzzis and gyms. On the other hand, you can also enjoy soaking ion the sun on a lounge chair while you watch the ever-changing view. Absolutely! If your children enjoy games, sports, swimming, movies, seeing new and interesting places, they will love cruising. The cruise staff is educated in keeping the kids busy and entertained. As well as nightly babysitting. There are supervised children's programs for kids of all ages. Best of all, most cruise lines offer greatly reduced rates for children. Is there life after dark? At night, options aboard a cruise ship are plentiful. There is dancing, live entertainment in the nightclubs, discos and lounges. There are feature films, gambling (on most ships) and special events, such as the Captain's cocktail party, passengers' talent night, a masquerade party and midnight buffet. No! For cruise vacations, there is never a charge for any of the shows on board and the shows are first-rate and offer a variety of themes, all included in the price of your cruise. Will there be people like me on board? There is no such thing as a "typical cruise passenger." All kinds of people take cruises. Passengers can vary from cruise to cruise. The experienced counselors at Just Cruises, Inc. can fit you into the perfect cruise for your lifestyle. In addition to receiving up to date information from the liens, we also cruise frequently so we can judge cruise lines by our own experiences. 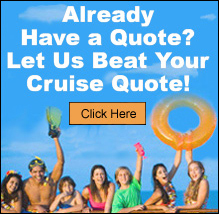 In this way, you have the most accurate information about your cruise. Cruise wear is similar to that of any resort. By day, the dress is very casual on ship or ashore. In the evening, ships vary as to the suggested attire. Many seven day cruises have two evenings where you'll probably want to wear something more formal. For men, a dark suit or a dinner jacket is the norm; for women, a cocktail dress, or a gown. Will I need to wear a tuxedo on formal nights? If you have one, great - bring it along. If you don't have one, don't go out and buy one for the trip. Even on the most formal ships, a dark suit and tie are acceptable. Many ships also have tuxedo rentals available. None, if you don't want to. There are low-calorie meals on every menu and plenty of time for a walk around the deck. Many cruise ships have a workout center, where you can take part in aerobics, treadmills, exercise bikes and more. There are also pools for swimming and golfing is available in most ports. Most cruise lines will bring you a complimentary cake and sing "Happy Whatever" to honor special occasions, such as birthdays, honeymoons, anniversaries and retirements. Make sure you inform the consultants at Just Cruises, Inc. and we will call in your celebration in advance. Will we lose touch with the outside world? That is entirely up to you. Some people will want to completely abandon the outside word and the jobs they are vacationing from. But for those who want to keep in touch, there are daily newsletters with world headlines, selected stock quotes, sports scores, etc. You can make phone calls to someone on shore through the ships radio operator while at sea. There are also phones at port where you can make phone calls at a lower rate than the ship to shore calls. Seasickness is not a problem for most people. The most popular ports boast some of the calmest waters in the world. Most modern ships have state-of-the-art stabilizers. This, combined with the advanced availability of accurate weather information, & the development of effective preventative medication have minimized any motion discomfort. The majority of cruise ships have a fully equipped medical facility and staff on board to handle any emergencies. If you have any medical conditions or will be taking any medication on board, please bring it to our attention so we may notify the cruise line. Can I book a group on a cruise? Just Cruises, Inc. has booked the smallest groups of a few people up to the largest groups of 450 people. We are able to work with the cruise lines to negotiate rates based on the size of the group. In most cases, we are able to send one FREE passenger with every eight cabins booked. Call or email us for complete details. Cruises are great. Are there any negatives? Only one - you will have to eventually disembark the ship and return to reality. In all seriousness, cruises have the least amount of travel negatives. There are no hassles of packing and unpacking at the different ports. There are no dinner reservations to make. No unexpected expensive restaurants or nightclubs; You have a number of options on board and on shore to choose from. And, more importantly, there are so many cruise lines and ship destinations that you are sure to find the perfect location and cruise for you. The cruise staff and crew are dedicated to making your vacation the best ever.